• Microprocessor “Touch Plus Control” with display. • 26 pre-set programs (4 economic programs). • Possibility of programming, export and import programs through USB memory, without limite. “WASH CONTROL” management software included. • 8 signals for automatic liquid dosing, programmable in time and delay. • Possibility to install an automatic detergent doser on the rear of the machine. • Detergent dispenser with 4 compartments (pre-wash, wash, bleachers and softeners). • Water levels completely modifiable. • 3 water inlets (Hot water, Cold water, Soft water). • Safety switch for door opening. 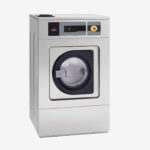 • Wash and spin speeds are configurable..
• These machines have electronic control of imbalance with frequency variator, that detects the load uncentered before spinning. • Standard frequency: 50 – 60 Hz. Hard mounted machine. Machine must be fixed to the floor. Optional version for ETL certified product.